In 2007, Jon and Jane built their retirement home on five acres (2 ha) of land near Eugene, Oregon. Avid gardeners, they planned to raise day lilies and iris on two acres and to manicure the rest of their grounds like a golf course. Cashing out their 401(k)’s just before the market crashed, they decided to spend a large part of their windfall making their dreams come true with hundreds of thousands of dollars of professional landscaping. By the spring of 2009, they had a real showplace. They were blissfully unaware of the mole problem in the area. And by the summer of 2009, their showplace was beginning to fall apart. Moles had dug holes everywhere they had laid down turf. Beautiful flowers would plop down to the ground just as they were beginning to bloom. Even a 200-year-old Douglas fir started to lean to one side like the Tower of Pisa. Jon and Jane’s dream home was safe, but their five acres were being ruined. Most homeowners in their area had more problems with gophers, but the pest behind Jon and Jane’s personal landscaping catastrophe was an invading army of moles. In this article, we will look at natural or humane and trapping methods for eradicating moles. Moles are a vexatious pest for homeowners. Humane homeowners choose to avoid firearms, poisons, mole traps, gas bombs, flame throwers, and flooding. These methods don’t usually work, although trapping does. Every method of trapping a mole, unfortunately, also kills them. When the concern is how to purge moles naturally and humanely, however, it’s important to understand that natural methods that really work, have to be applied regularly to keep moles at bay. 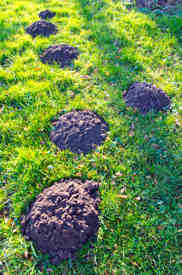 Moles multiply in well-maintained organic lawns and gardens. Small numbers of moles can do more good than harm. They loosen and aerate the soil, and by eating grubs, they keep beetles in check without need for insecticides, this is according to the Internet Centre for Wildlife Damage Management website. The problem comes with moles when there are so many that their molehills become both numerous and unsightly, and their tunnels topple flowers and even trees. The problems are most acute where generous rainfall and fertile and friable soil allow plants to grow without putting down deep roots. The solution to removing moles is not to stop caring for plants. The more time you spend cultivating your lawn and garden, the more easily you will get rid of them. Start by keeping grass cut short so you can quickly locate mole activity. If you live in an area that has acidic soils, don’t forget to use potash and fireplace ashes as appropriate for your plants. Moles don’t like it. And for small garden spaces, use simple and natural mole deterrents or traps to either purge them from your property or kill them. A good strategy is to clear moles from a limited area and then expand the control zone outward. Suppose you have an issue with moles disturbing plants in beds around your house. This is not a place to be flooding mole tunnels, trying to burn out moles with propane gas, or trying to asphyxiate them with carbon monoxide (which rises out of the ground or out of a basement). It is not the place to be putting out poisons that could be found by pets or children. But it is a place where you can make feeding on grubs and worms to be more trouble to moles than benefit. The easiest way to exclude moles from flower beds is to dig in a mole-proof barrier all the way around them, except on the side of the bed abutting the foundation of your house. The flashing around your flower bed will need to be dug in about 30 cm (12 inches) deep, extending an a few centimetres (an inch or two above the level of the ground). This edging should be made of a solid sheet of metal, usually aluminum, or tough polyethylene plastic. If you use brick or ceramic, it needs to extend about a foot below the ground. Edging garden beds may not exclude every mole all the time, but it makes tunnelling into the bed to get worms and beetles a much greater expenditure of energy for the mole. Once the bed is isolated, you can put down bloodmeal, castor oil or castor meal pellets, cayenne pepper, or human hair. You might even use a product like Shake Away Fox Urine Granules. These mole deterrents are biodegradable and eventually nourish your plants. In the meantime, combined with effort required to tunnel under the edging, they make the bed an inhospitable location for moles. As you might expect, odor repellents are a great way to force moles to vacate small spaces. Nevertheless, they are not an effective way to clear moles from large areas of land. The good thing about using natural odors is that it breaks down into nitrogen-rich fertilizer for your bedding plants without endangering pets or people. 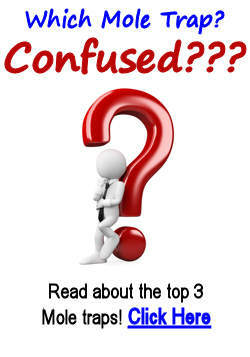 What are the odors that drive away moles? Bloodmeal, bonemeal, and fox urine crystals all make moles pause to listen for predators. Castor beans contain a poison called ricin that is deadly to moles and people. They won’t eat the beans. They will just leave the scene. Don’t put out castor beans, however, if there is any possibility that they will be eaten by children or pets. Human hair also eradicates moles from small spaces. The problem with these natural and humane mole repellents is that they are only practical for very small spaces, and even these tiny areas should be protected by aluminum edging or brick that extends a full 30 cm (12 inches) below ground level. Since even a light rain washes the scent away, remember that organic mole deterrents have to be reapplied every few days. The flower bed is the perfect location to place a mole chaser. Mole chasers emit an annoying high pitch that keeps moles awake during the daytime and midnight naps. If you place a mole chaser in the middle of your yard, moles will sometimes burrow right up to it and, despite the fact the chaser is an inanimate object, try to frighten it away. When they find they cannot make the chaser move, they will simply move their activities about 20 meters (65 feet) away. If you place a mole chaser in a flower bed after you have dug in edging, the combination of the physical barrier and any odoriferous deterrents you have put on the bed chases moles away from your house. The simple fact is that people tend to have either very good or very bad experiences with sonic mole chasers. As a deterrent for a small area, they work quite well. As a repellent for a large area, they seldom do much good. Moles can always dig a little deeper or a little farther way to avoid the sound if they have a large enough space. The main problem with using these sort of products for getting rid of moles is that they are electronic and so cannot be used in the rain or even put on wet ground. Furthermore, ultrasonic sound is unable to pass through solid objects so if there any obstructions, then the mole will not hear it. Getting rid of moles further out in the yard requires more effort. If you don’t want to kill moles, the best you can do is to make their stay in your yard so unpleasant they will move on. Don’t bother with trying to remove mothers and their babies in the early summer. They will be very hard to “persuade” to move. But any other time of year, look for signs of recent mole activity in your yard. Place a shovel into the ground 2 or 3 cm (about an inch) behind the molehill into the tunnel. Then locate other sites of recent activity and do the same thing. You won’t kill any moles by blocking the entrances to their tunnels. They can always dig another way out. But you make make maintaining tunnels in your yard so much work that they move away. Flooding tunnels won’t kill moles, but it may aggravate them enough to make them move. The best way to use flooding to control moles to flood a single tunnel for just a few minutes, until the first 1 to 2 meters of the tunnel becomes so muddy that moles cannot run to the entrance. Don’t bother with old tunnels. Flood tunnels that have only recently appeared in the lawn, preferably in the last 12 to 24 hours. What you do not want to do when you flood a mole tunnel is to send water under the piers and beams of your home’s foundation or into your basement. You do not want to leave the hose running for hours and days until a giant sinkhole swallows up your lawn. You do not want to flood the ground underneath lawn sprinkler systems, and you do not want kill water-sensitive grasses, shrubs, flowers, and trees. But a few minutes of water sprayed into the mole’s tunnel may make the mole move, and may feel especially satisfying. Natural methods never remove moles for good, and they have to be applied on a continuous basis. But if your personal ethic affirms the worth of both small wild animals and your landscape plants, natural methods are the best way to keep mole problems under control. Odor and sound are never enough to remove moles from substantial spaces, areas of 1000 square meters (about 1/4 acre) and up. The only way to liberate large spaces for good, is to kill them. Some of the most obvious methods of killing moles, however, don’t really work. An obvious way to do away with moles is to shoot them. A shotgun scatters pellets along the path of a fleeing mole. One pellet is enough to kill the animal. The problem with shooting at moles, other than the obvious risk of shooting one’s self in the foot, is that not just moles are hit by pellets aimed at the ground. Water lines, gas lines, and telephone and cable connections can be severed by the shot intended for the mole. Add to that the reality that most communities have strict laws about the discharge of firearms within corporate or city limits. Shooting at a mole in the middle of the night is a sure-fire way to gain the opportunity to spend several hours speaking with the police in most locations. There are other methods to get shot of moles that just don’t work. Electrocuting moles and worms with a worm shocker (designed to force earthworms to the surface with a mild electric shock to kill them with a strong electric shock) is as likely to shock the human operating the device as it is to shock a mole, especially when the ground is wet. Another method people use, is their car exhaust fumes. Carbon dioxide from an auto exhaust drifts down into a mole tunnel, but the mole is adapted to live in conditions of high carbon dioxide and usually does not die. Carbon monoxide from an auto exhaust is toxic to both moles and people, but it tends to drift up rather than down. You don’t want your epitaph to read that you died trying to kill moles with fumes from the back of the car. Some baits contain poisons that can kill both moles and people. 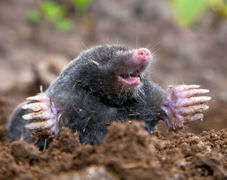 Ironically, the only relatively safe mole poison, zinc phosphide, is merely available to professional pest controllers. The only way of eliminating moles from larger landscapes that really works and that is attainable for almost all homeowners is trapping. Jon and Jane ultimately found success by placing mole traps in strategic locations around their property. Mole trapping, however, is not for the squeamish. The reality of any kind of mole trapping is that it is a lethal method. Moles have very high metabolisms. They need to feed almost constantly. Confining a mole in a small space without food is a death sentence, the mole likely to succumb to starvation in just a few hours. A quick kill is more humane than leaving a mole to starve. The reality of trapping moles is that many homeowners complain that traps don’t work, but that’s usually because many homeowners simply don’t have the information to use traps successfully. It’s important to remember that moles have a very good sense of smell. A mole that senses human scent, especially human sweat from human hands or feet, will back up in its burrow and proceed through a different tunnel. Handling traps with bare hands almost guarantees that they will not work. Traps must be set with gloved hands and moles must be removed with gloved hands. The gloves must not be washed in scented detergents. It’s much better to season them with moist dirt in which earthworms are found and to keep the gloves dirty, using them only for mole-related tasks. Another reason traps don’t work is that they aren’t set. Many “spring traps” have a safety bar that keeps fingers from getting caught in the trap before it is set off. The safety latch has to be released after the trap is put in place. And the most common reason traps don’t work is that they aren’t checked. A trap may not catch any moles for a day or two. But the trap cannot catch a second mole until the first mole is removed. 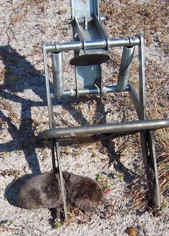 The least expensive mole trap is usually also the least effective mole trap. The more reliable mole traps cost a little more—but they enable homeowners to get moles under control faster. Be sure to buy enough traps to catch moles over your entire property to keep your landscape safe. Cut the end off an extension cord. Use electrician tape to tape the exposed end to a metal rod , stick it in the ground. Go inside to plug it in wait 5 minutes or so unplug. Wouldn’t that kill the moles ? It certainly has the potential to kill anyone following these instructions. It is ridiculously easy to take care of moles with a shotgun if you live where you can use a firearm in your yard. You just walk the active area every 15 minutes or so approaching dusk. If you have an active mole, you will see him tossing dirt. Creep up, draw a bead on the hole he is tossing dirt from, wait for a toss and then pull the trigger. Web sites like this discourage this method for obvious reasons but it’s the best way to do it. If it’s legal to kill moles like that in your county and there is no danger to you or the public, if you take a video or pictures of your methods, I will post them on this site. First off the carbon monoxide anyone may try to pipe into the ground wont escape fast enough or in high enough doses to harm a human. Maybe if you lay down with your nose in the ground you’ll be in trouble. None the less a good idea to not use this method at all. I really want to electrocute them 2 rods 2′ deep 10′ apart with 120 volt should do it don’t you think? How about 3 rods in a20′ triangle on 3 phase 480 volt. Yes that should do it, just make sure your not breaking any local laws.